As people enter into rehab, they may hear the term “dual diagnosis.” The fact is that those who are addicted to drugs or alcohol may also have a mental illness that accompanies the problems they are having with drugs or alcohol. If this is the case, the healthcare professionals will give them a dual diagnosis of drug addiction and clinical depression, for example. People know that they need to treat their addictions, but they also need to address their mental health issues. Medical professionals have not been successful with helping people treat their addictions when a mental health problem was also present because they believed that the addiction was a result of the mental illness. They believed that if they treated the mental illness, the patients would easily be able to give up their drugs. These professionals effectively treated the mental illness, but they discovered that their patients did not give up their addictions quite so easily. Most of the time, the addictions remained. Now, patients with a dual diagnosis have a better option. Treatment is currently available that does more than just treat the mental illness and treats more than just the addiction. How Many People Are Suffering from a Mental Illness and an Addiction? 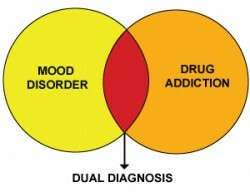 Dual diagnosis rehab will help treat a mood disorder and your drug addiction. Dual diagnosis is a very big issue. According to the National Institute on Drug Abuse (NIDA), six out of 10 people who are abusing drugs also have a mental illness. The reasons that so many people are struggling with an addiction at the same time that they are struggling with mental illness is not well understood. However, the one thing these two conditions have in common is the pleasure center in the brain. Mental illnesses are known to be caused by an impairment in the brain’s pleasure centers. Researchers have discovered that imperfections in the exact same pleasure centers also occur when people becomes addicted to drugs or alcohol. Contrary to what people believed before, they now believe that the drug abuse is what causes the mental illness. Another theory is that the answer is in the patient’s genes. Some people have mutations in their genes that make them more susceptible to particular mental illnesses. These same genes have also been shown to cause people to experience reactions to drugs and alcohol that people without the mutation do not experience. What Happens If a mental Illness and Drug Addiction Are Left Untreated? It can be very dangerous to leave a dual diagnosis of mental illness and drug addiction left untreated. Someone suffering from both of these conditions is more likely to hurt themselves or others. They often have difficulties living amongst other people in society and lose their homes after they have lost their jobs. It can cause problems when people think that their addictions are not as severe as they actually are. Another common issue is that they can choose to overlook the mental illness because it is preferable to them to be a drug addict or an alcoholic than mentally ill. They are also more likely to commit crimes that take them in and out of prison. In a regular rehabilitation center, treatment starts with detoxification. The detoxification process will remove the toxins from the patient’s body so that the patient can begin to live a healthier physical life. Then, the healthcare professionals can help them experience a healthier emotional existence through counseling. In a drug rehabilitation center, the addiction is going to be the focus of the treatment. The patients need to learn life skills that will help them keep a job, live in their own homes and rejoin society permanently without resorting to taking drugs or drinking alcohol. Because they have a dual diagnosis, patients with a mental health issue will also receive help with continuing their education, learning better parenting skills if they have children, finding adequate housing and receiving treatment for their addictions. Before the detoxification process can begin, the patient will take several tests to let the healthcare professionals know what drugs they are taking and what mental illness they may be suffering from presently. Then, the patients will be able to enter into the detoxification process. After detoxification is complete, patients can meet with their counselors to start their therapy sessions where both their mental illnesses and their addictions will be addressed. When accompanied with family therapy, these programs have been known to be highly effective. Dual Diagnosis Treatment Options - As dual diagnosis involves the presence of at least two mood or substance abuse disorders, treatment of this disorder requires attention to be paid to all issues at hand. Integrated treatment involves many different aspects. How Integrated Treatment for Co-occurring Disorders Works - Dual diagnosis, or the co-occurring of mental illness and a substance use disorder, is all too common. Integrated treatment ensures that both problems are addressed so that a person may fully heal and recover. Recognizing the Need for Dual Diagnosis Treatment - A dual diagnosis program will provide the resources and professional help a person needs to conquer a drug addiction while they are also battling with another mental illness, such as depression. Recognizing the need for dual diagnosis treatment may not be evident to a person at first, but if a person is aware that they have another mental illness in addition their drug addiction, they should seek out help from a dual diagnosis treatment center. Understanding the Dual Diagnosis Definition - Dual diagnosis means that substance use problems and mental health challenges are co-occurring. Treatment in these instances must address both a person's mental health and substance abuse. What is Dual Diagnosis Rehab? - Millions of Americans suffer from drug addiction, and a large portion of these people also have a mental illness present, such as depression or bipolar disorder. People who fit these criteria and need assistance conquering their drug addiction can receive the help they need at a dual diagnosis rehab.